Hypertension is a growing problem worldwide and one of the most dangerous risk factors for stroke or myocardial infarction. Despite numerous drugs on the market that can provide personalised treatment, blood pressure can occasionally not be controlled in some patients. Blood pressure control is a priority, as cardiovascular risk clearly increases in uncontrolled patients. 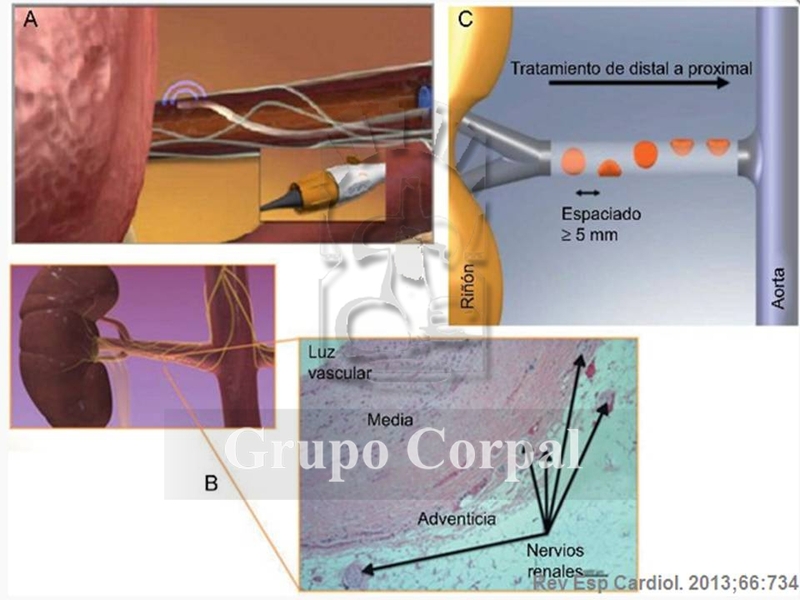 A percutaneous renal sympathetic denervation (RSD) method has recently been proposed, using a catheter to interrupt afferent and efferent renal sympathetic nerves by radiofrequency (RF) ablation, as treatment for patients with refractory hypertension. The procedure is safe and simple. The femoral artery is punctures and a guide catheter is inserted up to the ostium of both renal arteries. After angiographically confirming an appropriate anatomy (diameter >4mm and length >20mm), a radiofrequency catheter is inserted up to the distal portion of each renal artery, until the tip makes contact with the arterial wall. After confirming appropriate and stable impedance, radiofrequency is applied with temperature control to apply heat to the outer part of the wall and the sympathetic nerves that surround it. Applications are repeated along each artery, changing the position of the top and working backwards in a spiral to each ostium. The applications (4-6 per artery) are low strength (8 W or less) for 120 seconds. The patient can be discharged 24 hours after the procedure. After this intervention, blood pressure is usually reduced by 20-30/10-14 mmHg and this reduction has been found to persist for 2 years. This technique is useful for cases of hypertension that do not respond to 3-4 pressure lowering drugs.